2. Heat 11/2 tablespoons oil in a large saucepan over medium heat. Cook onion, garlic and bay leaf for 3 minutes or until softened. Add lentils and 21/2 cups water. Bring to the boil over high heat. Reduce heat to medium. Gently boil, covered, for 20 minutes. Cook uncovered for 10 minutes or until lentils are tender and liquid reduces. Season. 3. Meanwhile, season lamb rack. Place potatoes and lamb, fat-side down, on hot tray. Roast for 20 minutes, turning lamb halfway through. Transfer lamb to a plate and loosely cover with foil to rest. Roast potatoes for another 10-15 minutes or until crunchy. 4. Stir parsley through lentils. Dot with goat’s cheese. 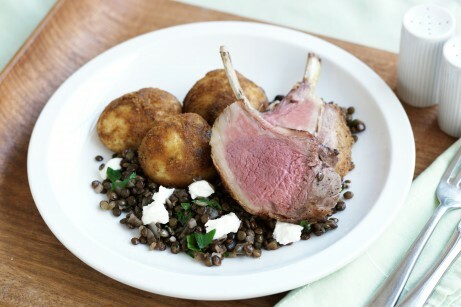 Serve carved lamb with lentils and potatoes. 5. Note: Wait for the lentils to be tender before seasoning. Salt stops pulses from becoming tender. 2 Heat 11/2 tablespoons oil in a large saucepan over medium heat. Cook onion, garlic and bay leaf for 3 minutes or until softened. Add lentils and 21/2 cups water. Bring to the boil over high heat. Reduce heat to medium. Gently boil, covered, for 20 minutes. Cook uncovered for 10 minutes or until lentils are tender and liquid reduces. Season. 3 Meanwhile, season lamb rack. Place potatoes and lamb, fat-side down, on hot tray. Roast for 20 minutes, turning lamb halfway through. Transfer lamb to a plate and loosely cover with foil to rest. 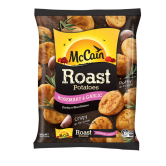 Roast potatoes for another 10-15 minutes or until crunchy. 4 Stir parsley through lentils. Dot with goat’s cheese. Serve carved lamb with lentils and potatoes. 5 Note: Wait for the lentils to be tender before seasoning. Salt stops pulses from becoming tender.